Kidney organoids profiled by single cell transcriptomics reveal spectrum of maturing nephron elements. (A) t-SNE plot including all cell clusters generated from scRNA-seq analysis of whole wells of kidney organoids. n, number of transcriptomes from 7 datasets from 4 individual experiments, 3 technical replicates. Dotted line encircles kidney clusters. (B) Violin plots showing relative expression of selected genes for each cell cluster in A. 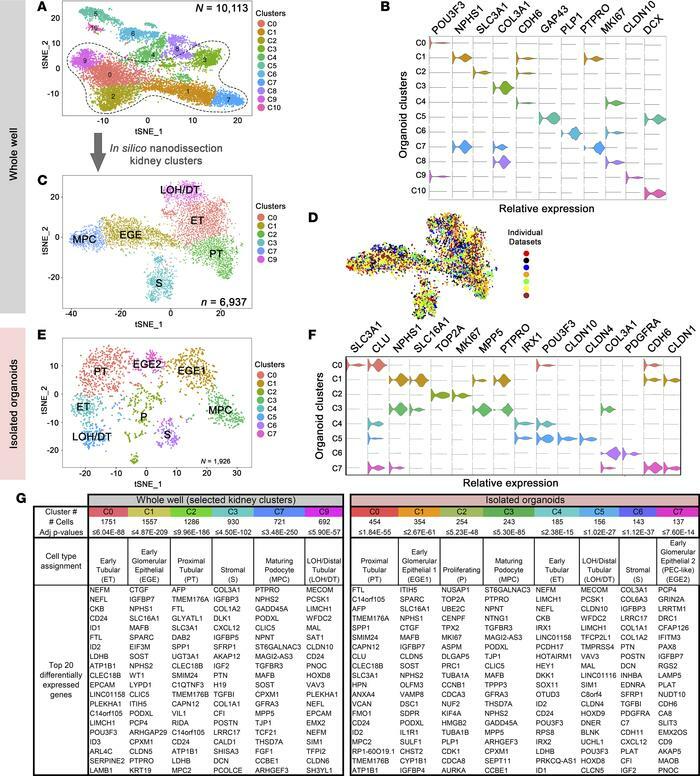 (C) t-SNE plot showing selected kidney cell populations in whole wells of kidney organoids, identified by clustering similar single cell transcriptomes. (D) Overlay t-SNE plots of 7 individual datasets contributing to C. (E) t-SNE plot showing all cell populations present in isolated organoids. Data representative of 3 separate experiments. (F) Violin plots for cell clusters in F, as in B. (G) Top differentially expressed genes in order of decreasing significance within cells of these clusters compared with other cell clusters from C on left, and F on right. Calculated using Seurat’s default parameters for nonparametric Wilcoxon rank sum test, reported with adjusted P values. LOH, loop of Henle. Gene names not italicized for ease of viewing in B, F, and G. See related Supplemental Figure 1, Supplemental Table 1, and Supplemental Table 2.